Quick! 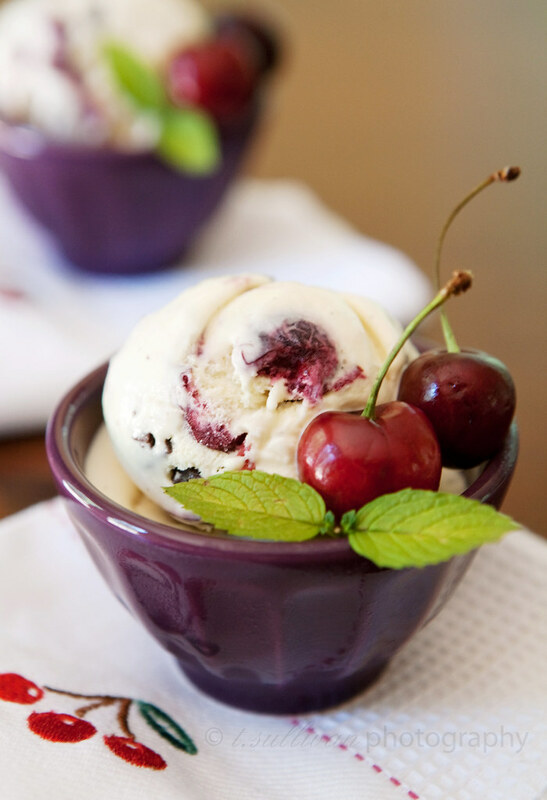 Before cherry season ends, you need to make this ice cream. Is it 100 million degrees where you live right now? This ice cream will help. I mean, it won’t make it any cooler outside, but you’ll be so enthralled with the smooth vanilla ice cream, the tart and sweet cherries and the crunchy bits of rich dark chocolate that you won’t notice how hot it is for a few minutes. I can’t stop eating this stuff. Do you know about The Perfect Scoop? It’s an ice cream cookbook written by David Lebovitz, and I think I can safely say it’s the best ice cream cookbook there is. The recipes in it are outstanding, and Lebovitz has you covered with everything you’ll need – from the obvious ice cream recipes to recipes for mix-ins, toppings, ice cream cones and more. If you like making your own ice cream, you should definitely buy The Perfect Scoop. Note: It’s best to prepare the custard base and cherries one day ahead, to give everything ample time to chill before churning and freezing. 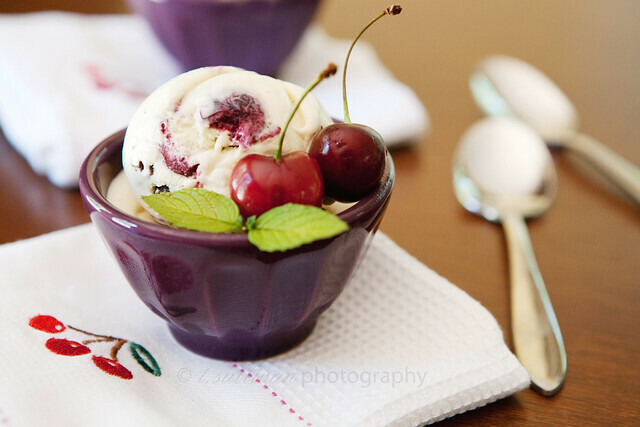 Roasting the cherries helps keep them from freezing into solid icy chunks in the ice cream. While cutting the roasted cherries into halves works OK, I recommended quarters because they freeze softer. Drizzling the chocolate in while churning the ice cream keeps it in small, melt on your tongue chunks. Whole milk was used in the original recipe, but I used 2% to lighten things up and still got perfectly creamy ice cream. I used Ghirardelli 60% semisweet chocolate. Preheat oven to 450° F. Place whole, de-stemmed cherries in an oven safe roasting pan or dish (I used a glass pie pan). Sprinkle with sugar and bourbon. Toss to coat. Roast at 450° for 10-15 minutes, stirring occasionally and keeping a close eye to make sure the sugar doesn’t burn. Once fruit is soft, remove from oven and cool. Pit the cherries and slice into quarters. Refrigerate in juices overnight. In a medium saucepan, heat milk, sugar, 1 cup of cream and salt over medium heat. Split vanilla bean in half, scrape seeds into the warm milk mixture and add used bean too. When milk is warm, remove from heat, cover, and let steep for 30 minutes at room temperature. Pour the remaining 1 cup of cream into a large bowl. Set a fine mesh strainer on top and set aside. In a medium bowl, whisk egg yolks. Slowly add about 1/2 cup of the warm milk mixture to the egg yolks, whisking constantly, to temper the eggs. Pour the warmed egg mixture into the remaining milk mixture in the saucepan and whisk to combine. Return the saucepan to medium heat, stirring constantly, until the mixture thickens enough to coat the back of a spoon. Remove from heat and pour through the mesh strainer into remaining cream. Add vanilla extract and stir over a bowl of ice water until cooled to room temperature. Cover tightly and refrigerate overnight. Note: My ice cream maker nearly overflowed once everything was added, so you may want to omit some of the ice cream base when churning to make sure you have enough room! After ice cream mixture and cherries have cooled overnight, churn in your ice cream maker according to the instructions. While the ice cream is churning, heat chocolate in 15 second intervals at 50% power in the microwave, stirring between intervals, until melted smooth. With 5-7 minutes left to churn, start drizzling the chocolate very slowly into the ice cream mixture. Once all of the chocolate is incorporated, add cherries, juice and all. Transfer to a freezer safe container and freeze for at least 4 hours. I’ve heard SUCH good things about this ice cream cookbook and your ice cream just further corroborates that! Looks fantastic. That ice cream looks so good and I don’t normally even like cherries. Beautiful photos, as always! I really want to get an ice cream maker, but I’m scared I’ll either never use it or, worse, make ice cream all the time and gain a million pounds! Decisions, decisions. If I do get one, I’m definitely getting that cookbook with it. This combination kind of reminds me of a grownup version of Cherries Garcia… will have to try it when our current batch of chocolate-bourbon ice cream is finished. Ok, I’m immediately adding chocolate bourbon ice cream to my list of recipes to make. That’s sounds awesome! Gorgeous ice cream and equally gorgeous photos!!! I will definitely get the book you have recommended! I have the 1 1/2 quart Cuisinart with a freezer bowl. Aside from the fact that it’s a little noisy, I love it! Thanks for posting this recipe! I tried it out on the weekend, and it was delicious! It was SO good. My ice-cream turned purple since I added the cherry syrup/juice too. And I never got my chocolate to the drizzle-able stage but I added globs of it. If you include cherries, the juice and all, it turns the ice cream pink. So what did you do to keep the ice cream white? I included the juice in my ice cream, but I didn’t get a whole lot of juice when I roasted my cherries. Maybe they just weren’t juicy? Or maybe I should have roasted them a little longer. If you don’t want your ice cream pink, you could always omit the juices. That looks and sounds like the most amazing thing. Ever. Have to try this!! I recently purchased the Perfect Scoop, and I completely agree with you. It’s the best ice cream book ever! I was looking through it yesterday and kept stopping at this ice cream, and wasn’t sure what to make. Know I know!